After a long hiatus due to work, I am back with quite a few new builds. I am very excited because these are the first sets that I’ve build in 2019 and please leave comments on whether you like them. 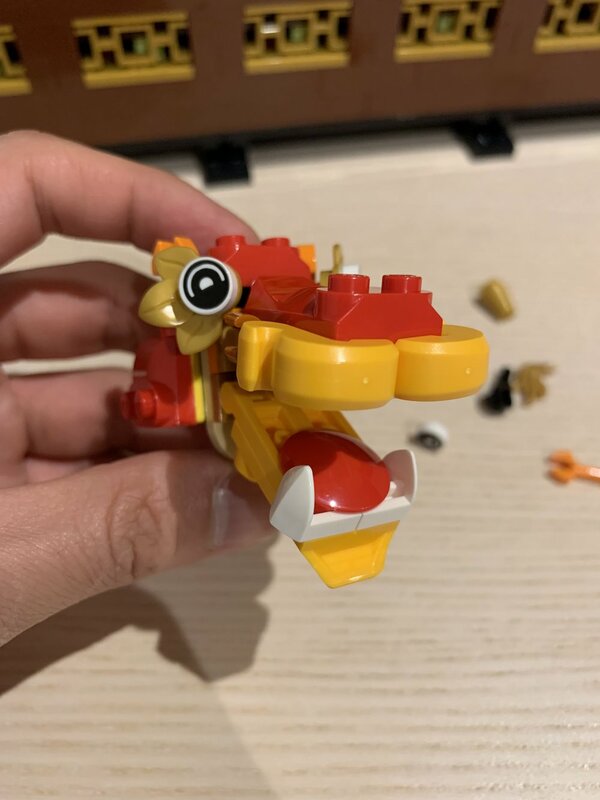 Lego has launched 2 new Chinese New Year sets in 2019 which are targeted at the Asian market. According to other blogs and news, these sets can only be purchased in Asia Pacific and Oceania (Australia) regions. Before I managed to get my hands on these sets, I saw on eBay that some of these sets were being resold for 3-5 times the retail prices. There seems to be a lot demand from the western countries and had proven to be one of the most sought after limited releases. For those who are wondering how I got my hands on these, I got my parents to buy it from Bricks World in Singapore. My Dad had to queue for 5 hours because the shop could only sell to walk in customers after 2PM on launch day. According to my mom who travelled to Sydney to give it to me, Singapore’s Changi Airport gifts store were fully stocked the very next day as well. This is a relatively easy and small set to build as compared to my other Creator Expert series. There are various unique coloured pieces and Chinese New Year themed mini figs! As I was building the set, I was very amazed by how the internal mechanism was designed. It shares similar techinques with other Creator sets such as the Carousel, but with a sight twist (pun intended). Top view before the dragon comes. Once completed, the “Dragon” will move up and down mimicking the actual Chinese Lion dance. There are bits hanging off the edges of the dragon which makes a crackling sound. During a actual lion dance, there would usually be drums and traditional Chinese fireworks that makes VERY loud popping noises. I loved watching these shows as a kid back in Singapore while growing up. For those of you who are unfamiliar, the Lion dance is used as a sign of good luck. Many businesses would hire a lion dance troupe to perform outside their new business premises to build hype. In other instances, there are full on lion dance performance which involves people holding the lion costume and hopping around on tall beams like a stunt show. Here’s a video showing the actual thing! The overall build of this thing is very Lego; rock solid. The mechanism is very smooth and the set sits on 4 legs on the sides to lift it up slightly. I particularly love the minifigs that came with it, there is a man in a pig costume (Because 2019 is the Year of the Pig), and 4 other minifigs in traditional costumes. As I mentioned before, I am very excited that Lego has embarked on a “Chinese” cultural journey and I am super psyched to see more of these sets. For those who are in Australia, the set seems to be completely sold out on Myer and several reddit users has expressed their frustration on the complete lack of supply. I would highly recommend buying from asian countries. My partner also mentioned that you can purchase it on the Lego Taobao store and get it shipped to Australia. If you liked this set, there will be another post of the Chinese New year reunion dinner set!